This week’s loss was smaller than last week’s, but a loss is a loss no matter how small. I’m pleased with my result, given that Ma Nature was in town this past week, my calorie intake increased slightly (based on my doctor’s recommendation that I do so), and I was sore from all the walking I did all week long. I figure somewhere in there, I was retaining a little fluid. I also figured out this past week that my sleeve’s capacity is a tiny bit over 3 ounces now. This is both good and bad, as I explained in a previous post, but I am still trying to undereat my capacity so that I don’t fall back into the habit I used to have of eating until I was uncomfortably full. I am grateful that I read about this strategy on the OH VSG boards, and it is one of the things I have learned from the vets there that has served me well. The undereating my capacity strategy has worked pretty well for me so far, so it is a tool I’ll continue to use. I am also going to try and increase my fluid intake to more than 12 cups of water daily. I’d like to aim for a straight up gallon every day, but this is going to be tough. I’ll give it a shot though. This week, I decided to raise the bar by lowering my goal. Let me explain. After doing some thinking about my original goal weight, I decided this week to lower my goal weight a little bit–by about 10 pounds. The reason why is that my original goal still had me in the “obese” category per the BMI charts. My surgeon’s goal weight for me definitely has me squarely in that same category, which is one of the reasons why his goal for me is not good enough for me. I dropped my goal weight by 10 pounds to put myself in the “overweight” category. You’re probably wondering, why the hell would you have surgery to lose weight just to stay overweight? WTF? Well, I know that I will never see what “normal” is for my height–I have a very large frame, and for me to weigh between 134-151 would look really unhealthy on me. I would look heroin chic and skeletal, neither of which are terribly attractive to me. As it is, I am already starting to feel my sternum and pelvic bones under my skin, and it’s freaking me out! So now I am aiming for 170. I’ll know better once I get closer to it, but right now that’s the long term goal, weight-wise. Long term, I just want to be healthy. In the meantime, my short term goal is to lose 30 more pounds before my anniversary in November. I think it is doable. I’d like to lose 50 more total by Christmas. I feel like this is also doable. I know what I need to accomplish this–start moving a lot more, for one. This week I am going to make it a point to hit 7,000 steps each weekday and get to the gym on the weekend days for strength training and more cardio. I am also introducing a few more veggies into my eating as I think keeping to eating exclusively meats is preventing me from losing as much as I could. While I take some pretty incredible multivitamins, I miss getting nutrition from veggies…never thought I’d say that! I also miss the variety and diversity in my diet–there is an awful lot of sameness in what I eat. There is security and comfort in sameness, but for me, there is also a lot of mundanity in sameness with regard to my food. I’ve explained before that for me, sameness in eating = boredom with eating, so I have to tread lightly where eating the same thing all the time is concerned lest I start finding other things to eat that will not help me get to goal. Next week will be two months post-op, and I’m hoping to be closer to 75 pounds down by then. I probably won’t hit exactly 75 pounds gone but I know I will be closer to it next Sunday than I am today. I’m also starting to think ahead to next spring and where I’d like to be weight-wise. I think that if I can get to 230 by my 41st birthday, that would be fantastic. That would put me at 10 pounds away from my doctor’s goal, and only 60 pounds away from my new, lowered goal weight. I am not so concerned about hitting my overall goal by my one-year surgery anniversary. If I can hit it by 18 months out, that’d be fantastic, but as long as I hit it, time doesn’t matter to me. I just want to hit my goal weight, period. I spent the better part of today doing a little shopping, getting pampered, and cooking meals for the week. My husband treated me to a pedicure today at a fantastic place a couple of towns over. I’d gone there the day before I had surgery to have a pedicure, and it was time to have one done again as my feet were looking pretty ugly and busted. I seriously got the best foot and leg massage of my young life today. And my toes look fabulous. When we got home, I ate dinner and then began cooking the things I’d planned to cook for my meals this week. Hubby graduates to soft foods this week, so I made him a pound of ground sirloin–he is brave! I didn’t brave beef until my second week on soft foods, and even then, I didn’t eat it just by itself! He has done really, really well post-op. I am so proud of him, and he is looking fantastic. Top: Green chile chicken casserole. 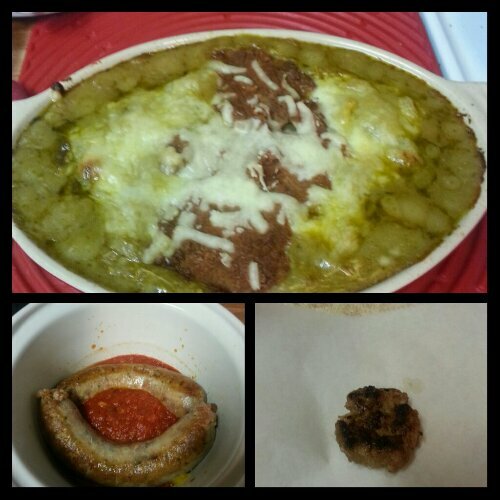 Bottom left: Italian sausages, peppers and onions in marinara. Bottom right: homemade chipotle maple pork breakfast sausage. I decided to use the chicken I’d frozen last week when I made a batch of broth from a rotisserie chicken for my husband, who was on full liquids last week. I used the chicken breast to make a green chile casserole by using fat free refried beans in place of corn tortillas, which is what I would normally use. I was able to get 11 3.25 ounce servings out of the recipe I created. I dished out 6 servings for lunches and dinners this week, froze 4 and ate one as my last meal for the day. It was really good! I was hoping the beans would set up a little firmer, but they didn’t and the dish turned out to be more of a goulash consistency, but it was still really good. Another thing I made was crockpot Italian sausage, peppers and onions in marinara. I’ll give that a try tomorrow. I also mixed up some homemade breakfast sausage. This was something I’d been wanting to do for a while and I figured that while I was at the butcher yesterday, I’d pick up some ground pork and give it a try. Place the pork in the bowl of a stand mixer. Add the spices and using the paddle attachment of your mixer, mix the meat until the spices are evenly mixed throughout. Use a food scale to measure out even portions if you are making patties. Cook patties immediately or freeze between sheets of waxed paper or deli paper. This can also be cooked as loose meat, such as for sausage gravy or for breakfast casseroles. If you make patties, each 1.75 ounce patty (pre-cooked weight) has 84 calories, 9 grams protein, 5 grams fat and 1 gram carbohydrates (per MyFitnessPal). I was able to get 11 1.75 ounce patties (pre-cooked weight) plus one tiny half-ounce patty that I cooked and ate to sample my handiwork. It was really good! It did not need salt, and rendered very little fat. I froze the patties for both hubby and I to eat on over the next couple of weeks. I think the next batch I try my hand at will be made with turkey, and I may try a batch with ground chicken. One thing is for certain: I won’t be buying sausage from Jimmy Dean and his minions again! 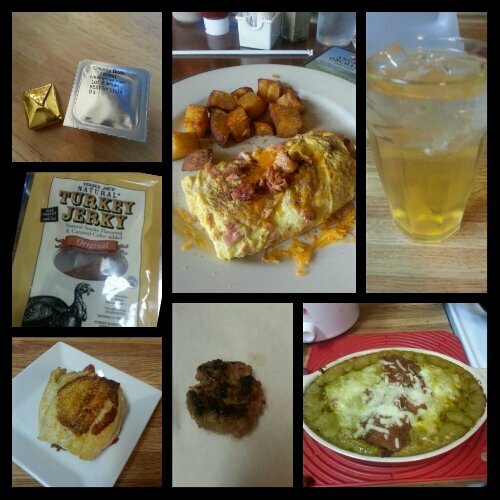 Today’s food choices, from upper right: Isopure Zero Carb; green chile chicken casserole; homemade chipotle maple breakfast sausage patty; Trader Joe’s crab-stuffed flounder; Trader Joe’s turkey jerky; multivitamin and calcium supplements x2; a little less than half of a ham and cheese omelet with 3 home fries (I think they were baked because they were not greasy at all). 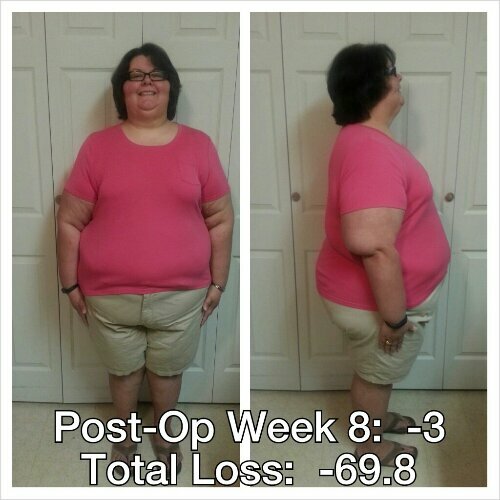 This entry was posted in daily bites, post-op, progreso, success, vsg, weight loss surgery, werk! and tagged daily bites, expectations, goals, meal planning, photo post, post-op eating, post-op life, progress report, raising the bar, recipes, VSG, vsg realness, WLS. Bookmark the permalink. ooooo – I want to try to make the sausage patties! That sounds delish! We are the same height, if I remember right. I have been 130, 150, AND 170! I know 170 looks pretty good on me, 160 looks great. So, I say 170 is a great goal to aim at! It is all about degrees and small steps. You are doing great and looking great! The sausage patties are so easy to make, and the best part is that you can control the salt and sugar in them, and there aren’t preservatives! I think in the end it costs less as well. I have never seen myself at 170 so I will be curious to see what I look like when I get there. I mean, I know at one time I had to weigh that to get where I am but I sure don’t remember it! Thanks for all your encouragement…it means a lot!